Updated by Phil Edwards on July 29, 2015, 5:04 p.m.
Giovanni Stanchi’s painting from the 17th century shows how much watermelon has changed. Look in the bottom right corner of this painting. If you’ve never seen a watermelon like that before, you’re not alone. 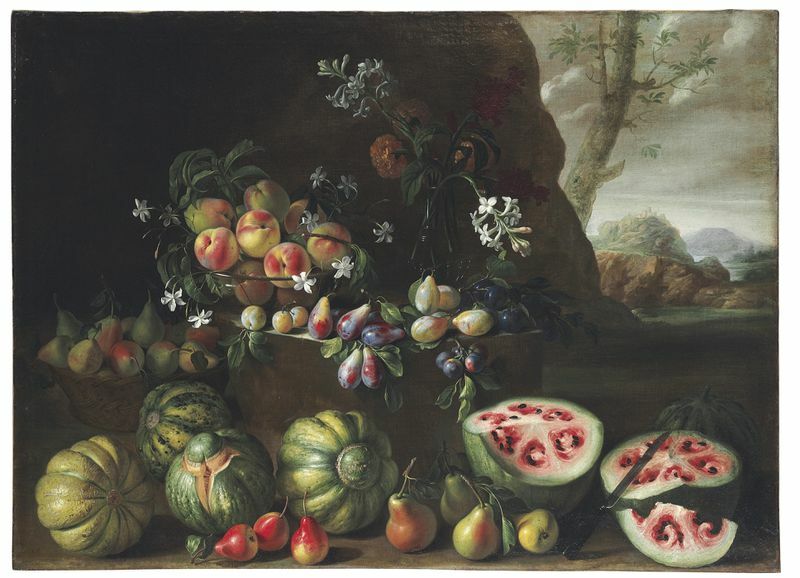 This 17th-century painting by Giovanni Stanchi, courtesy of Christie’s, shows a type of watermelon that no one in the modern world has seen. Stanchi’s watermelon, which was painted sometime between 1645 and 1672, offers a glimpse of a time before breeding changed the fruit forever. The watermelon, then and now. James Nienhuis, a horticulture professor at the University of Wisconsin, uses the Stanchi painting in his classes to teach about the history of crop breeding. “It’s fun to go to art museums and see the still-life pictures, and see what our vegetables looked like 500 years ago,” he told me. In many cases, it’s our only chance to peer into the past, since we can’t preserve vegetables for hundreds of years. The watermelon originally came from Africa, but after domestication it thrived in hot climates in the Middle East and southern Europe. It probably became common in European gardens and markets around 1600. Old watermelons, like the one in Stanchi’s picture, likely tasted pretty good — Nienhuis thinks the sugar content would have been reasonably high, since the melons were eaten fresh and occasionally fermented into wine. But they still looked a lot different. That’s because over time, we’ve bred watermelons to have the bright red color we recognize today. That fleshy interior is actually the watermelon’s placenta, which holds the seeds. Before it was fully domesticated, that placenta lacked the high amounts oflycopene that give it the red color. Through hundreds of years of domestication, we’ve modified smaller watermelons with a white interior into the larger, lycopene-loaded versions we know today. Of course, we haven’t only changed the color of watermelon. Lately, we’ve also been experimenting with getting rid of the seeds — which Nienhuis reluctantly calls “the logical progression in domestication.” Future generations will at least have photographs to understand what watermelons with seeds looked like. But to see the small, white watermelons of the past, they too will have to look at Renaissance art. Further reading: Here’s what 9,000 years of breeding have done to corn, peaches, and other crops.